Just like the good old days. 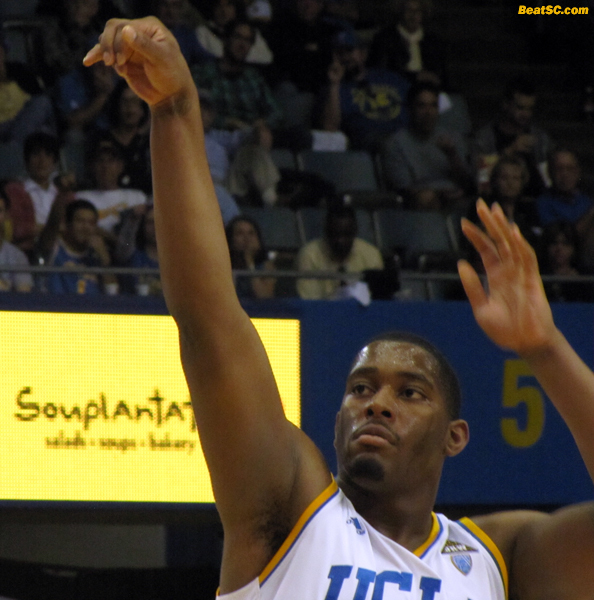 UCLA won a Basketball game by 43 Points, led by a dominating big man in the Middle. Of course, in the olden days, they used to do it all the time, and against GOOD teams. Nowadays, it takes a creampuff opponent, and it’s a very rare occurence, even versus the cupcakes of the World. On Saturday afternoon, Bruin fans got a blast from the past, with UCLA’s creaming of UC Davis, 82-39. With Center Josh Smith playing with more energy and focus, the Bruins came out sharp right from the beginning, going up 10-0 in the first few minutes, and expanding the lead to 25 a few minutes later. The Aggies missed 19 of their first 21 shots — some tightly contested, some wide open — and the Bruins never looked back. With under 3 minutes to go in the Half, it was 43-8. The out-weighed and out-verticalled Aggies had no answer for the inside presence of Smith and David Wear, who could both do anything they wanted inside the Davis Defense. Smith was at a season-low weight, and it was evident, as he exhibited a jump in his step on both ends of the court, that hadn’t been seen all year. He scored 18 Points on the day, and grabbed 10 Rebounds as well, to tally his first double-double of the Season. He also Blocked 3 shots. Wear scored 15 and grabbed 6 Boards. By the Bruins freezing the Aggies out of the Paint, and with UC Davis’ ice-cold shooting, it was enough to put the game on ice early, despite a lackluster shooting effort by the Bruins’ recent leading scorer Lazeric Jones. Jerime Anderson continued his slump from the outside as well, and Tyler Lamb didn’t add much either. But it didn’t matter, with Smith and Wear taking care of business inside. Norman Powell came off the bench with more impressive minutes, scoring 8 and grabbing a whopping (for a Guard) 10 Caroms, and Anthony Stover also was an effective contributor, on the Defensive end, of course, notching FIVE Blocked Shots. "SOMEBODY CALL A VET" was published on December 17th, 2011 and is listed in Blue & Gold News, UCLA/usc/Sports Photos.